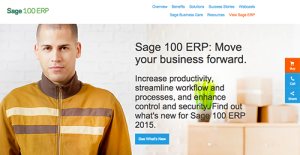 What is Sage 100 ERP? Sage ERP 100 is a platform designed to help small and mid-sized businesses manage their resources with a very effective enterprise resource planning (ERP) toolkit. The system delivers a comprehensive financial and operation functionality, which includes manufacturing and inventory features right out of the box. There are several modules intended to cover various aspects of ERP operations and processes such as core accounting, distribution, manufacturing, business intelligence, customer relationship management, human resources (HR), time and project management, to name a few. Overall, Sage 100 ERP secures effective management of different types of manufacturing processes, and stays ahead of all updates in the dynamic production processes. Thanks to it, manufacturers find it easy to track jobs, materials, and opportunities, and manage complex and discreet processes all from a single platform. The biggest advantage of this system is that you also get to use it to govern make-to-stock and build-to-order jobs. To make matters even better, Sage 100 offers a flexible pricing scheme, where you will be asked to share business details and specific needs, and receive consequently a special package to cover for them. With Sage 100 ERP, you pay only for what you genuinely need. How can Sage ERP 100 help your business grow and attain success and hit commercial goals? According to our experts, there are many ways in which this can happen. To start with, Sage 100 ERP is an easy-to-use and comprehensive enterprise planning system whose implementation is highly-modularized, and allows companies to purchase or deploy only the functionalities they need. The pricing scheme is also adjusted to this concept, meaning that you will be charged only for features you’ve specifically requested. As satisfied users report, working with Sage 100 ERP is an enjoyable experience, as the product is very stable and easily customizable. What they appreciate the most is how the system allows them to store historical budgets in all of their records, or create such independently when planning expenses for upcoming fiscal periods. As a result, they get to save valuable time, and cut expenses for at least a half of what traditional ERP systems require. Sage 100 ERP is also a system within which the user can create financial statements, and choose between a variety of pre-built and pre-defined templates to make financial operations more industry-specific. Another important advantage is that in its current form, Sage 100 ERP support remote access and backs up data and operation overnight. Highest security and protection precautions are in place to ensure no intrusion will harm your corporate operations. Once you purchase the product, you will be able to connect it to your Sage Data Cloud, and easily import/export information from the two. This native integration also makes it possible to connect Sage 100 ERP to a variety of Web and mobile services and applications. Every company has different needs and requires an application that can be customized for their size, kind of staff members and buyers, and the specific industry they are in. For these reasons, no software can proffer perfect features off-the-shelf. When you try to find a software system, first be sure what you need it for. Read some Sage 100 ERP reviews and ask yourself do you desire basic features or do you want sophisticated functionality? Are there any industry-specific functionalities that you are searching for? Find the answers to these questions to assist your search. There are multiple elements that you need to reflect on and these include your finances, specific business requirements, your organization size, integration requirements etc. Take your time, use a few free trials, and finally zero in on the platform that presents all that you want to improve your organization efficiency and productivity. How Much Does Sage 100 ERP Cost? We realize that when you make a decision to buy Accounting Software it’s important not only to see how experts evaluate it in their reviews, but also to find out if the real people and companies that buy it are actually satisfied with the product. That’s why we’ve created our behavior-based Customer Satisfaction Algorithm™ that gathers customer reviews, comments and Sage 100 ERP reviews across a wide range of social media sites. The data is then presented in an easy to digest form showing how many people had positive and negative experience with Sage 100 ERP. With that information at hand you should be equipped to make an informed buying decision that you won’t regret. What are Sage 100 ERP pricing details? What integrations are available for Sage 100 ERP? Pros: I am tasked with creating and emailing invoices and this Sage software makes my job easy. I can easily integrate our sales orders into the software and then access and pull them up when I need them. Cons: Batch processing significantly hampers some of the daily tasks. This is one area that really needs improvement. Pros: I can use it on both Windows and Microsoft SQL Server. It comes with all the modules I need to help me stay on top of my company's activities. The product is just versatile, robust, and user friendly. Cons: Sometimes, getting help from the support team can be a pain. And when you get hold of them, it usually takes a long time before they resolve my issues. There is also an issue with their Excel exportation and scheduler. I love how integrated modules streamlines information flows from takeoffs to POs, etc. Integrated software takes out instances of redundant data entry and errors. I love how the software is so easy to learn and use right off the bat. Sage 100 ERP dramatically reduced the time we spent on project final costing. Back when we were using QuickBooks, we usually took more than 2 hours to get the job done. Sage 100 ERP has offered us with extreme veersatility and customization, enabling us to tweak the software so we can address our business needs head on. The product comes with GL modules that both stable and workable. Perfect for a small enterprise. If you need more information about Sage 100 ERP or you simply have a question let us know what you need and we’ll forward your request directly to the vendor.